COMMENT: Fairytales and football - it's happened before. 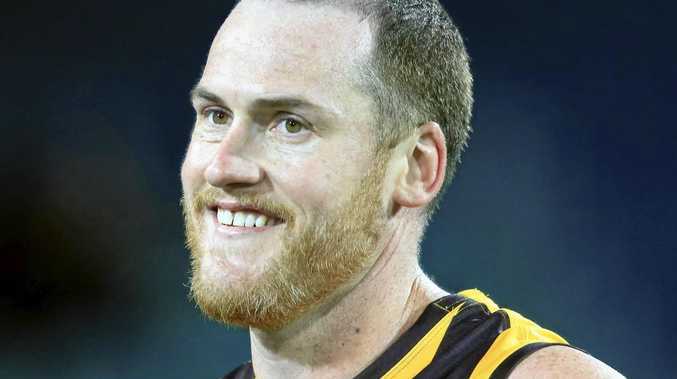 In fact, it happened last weekend when Jarryd Roughead made a successful return to senior AFL football for the first time since his club's most recent grand final win. But there are times when fairytales and football simply shouldn't be put in the same sentence. As well as Roughead, six Essendon players returned to senior action on Saturday night at the MCG following a year out of the game due to the WADA findings on the supplements saga. It was an emotional night highlighted by emotional celebrations, with the Bombers producing an upset win over the Hawks in front of nearly 80,000 people. But to the media types that morphed the return of six players from that WADA-enforced suspension into a "fairytale comeback" and a "fairytale victory" - please, some perspective. That is all types of disrespect to the heroes of our game. For Roughead, a routine check-up last year on the melanoma he had removed in 2015 showed the worst possible result via a biopsy. Not only had this non-discriminating beast returned, it had also spread to form four spots on his lungs. The initial diagnosis of a melanoma was found early enough to remove the danger spot, allowing Jarryd to return to the game after a two-week absence. All signs pointed to that procedure being a success. Then the good news - and good fortune - continued to flow for "Roughy" as he played a key role in Hawthorn's successful three-peat, making him a four-time premiership Hawthorn hero. That time, he got lucky. Jarryd's immediate football future was unknown and completely insignificant when considering that his existence as a husband, son and friend was priority No.1. His return to full health is a fairytale in its own right. But his return to the football field, at senior AFL level, is one of the great sporting fairytales of the modern era. His affable and brave approach makes him a role model for all of us. Like Roughead, former Kangaroo Jason McCartney made an emotional on-field return after enduring a life-threatening situation. McCartney and teammate Mick Martyn were standing at Paddy's Bar in October 2002, enjoying the Kuta district and a well-earned breather from the stresses of senior league footy. What confronted them next is something we simply can't comprehend: a war zone of pain and ungodly horror. But in a display of superhuman strength, Jason's focus was on the survival of others and not the extreme level of trauma experienced by his own skin. Despite suffering severe second-degree burns to 50 per cent of his body that very nearly cost him is life, McCartney still helped two sisters to safety. Rehabilitating from those injuries and rebuilding enough strength and subsequent movement to kick a footy with his boys in the yard would have been a fairytale. But real-life heroes aren't content with allowing the bad guys that continue to provide mayhem and death to the world defeat them. By not attempting a return to senior level football, McCartney, within himself, would feel that he allowed them to take a piece of himself that night. He wouldn't allow it. They had taken too much already. McCartney's return to play senior level football for North Melbourne in 2003 will go down as perhaps the most memorable moment in Australian sporting history. Aesthetically - with an abundance of padding, a long sleeve jumper and protective gloves - you knew that his level of determination to make it back was not at a level most humans are capable. We were watching a real life Superman. While his statistical performance that night was modest - 1.1 from three kicks and one mark - it was his match-winning contribution in the last quarter that had us all in tears and in complete awe of the fight displayed by this remarkable human. The strong mark and goal early in the term, followed by the clean hands and scrub kick forward that set up Leigh Harding's match-winner - no one will ever forget those passages of play. The sight of McCartney being chaired off the ground that night, having retired from the game after enduring the toughest rehabilitation for a return to senior level footy in its history, was the completion of a sporting and life fairytale. So please, when using "fairytale", be very careful to ensure it is a term that is respected in honour of the two aforementioned stories. These men are heroes and have earned a lifetime of adoration. "Fairytale" is not to be used when describing a round-one victory of a team that had six players return from their 12-month suspension for doping offences.